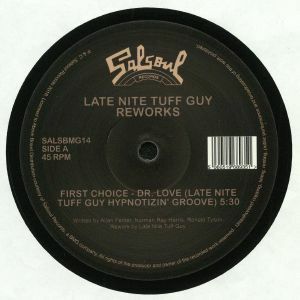 FIRST CHOICE/DOUBLE EXPOSURE/LATE NITE TUFF GUY Dr Love (Late Nite Tuff Guy Reworks) (Record Store Day 2018) vinyl at Juno Records. There's a whole load of Salsoul goodness that we often miss or skip, whether due to unavailability of reissues or simply because there's just simply too much of it, but this RSD 2018 release of Late Nite Tuff Guy Reworks hits the spot in all sorts of ways! The master edit-junkie and version freak steps up with three reworks of some pretty classic classics, namely First Choice's "Dr Love", Double Exposure's "Everyman" and, finally, First Choice's "Love Having You Around". House-tinged edits for you to VIBE to!